Ruby Gemstone and Emerald both have been serving the need of human being from centuries. The exotic appearing gemstones have been a source of attraction for ages. 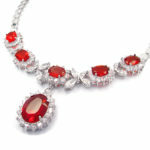 People of all ages since its availability have admired wearing rubies and emerald in the form of various jewelry items. Both auspicious gemstones have been gifted to us from the earth. Apparently, it is conceived that both emerald and ruby stone have equal value and characteristics nonetheless, these both stones possess certain properties that make them stand apart from each other. Let’s find out the main differences between Ruby and Emerald stone. 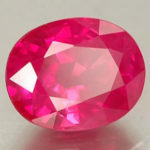 An elegant appearing ruby gemstone is an extremely hard or rigid gemstone. On the hardness scale, the gorgeous ruby scores 9.0 which is just subsequent to the mineral diamond. On the other hand, Emerald gemstone is slightly fragile in nature as compared to a ruby gemstone. On the parameter of hardness, the stone reaches 7.5 to 8.0 which is slightly lesser than ruby despite this, it is acknowledged as being one of the hardest minerals. 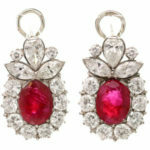 The scintillating ruby gemstone is discovered in delicate red color. The spellbinding red color of ruby stone attracts and allures every gem lover greatly toward it. A ruby stone is considered of rich quality as its intensity of red color increases. Hence, Burmese ruby is considered as the best ruby gemstone due to its dark red color. A ruby stone is found in various red color variations. On the other hand, an emerald stone is a green appearing stone. The intriguing green color of this stone frame this one of the most desiring stones. In comparison to ruby stone, the variation of color is likely less in the case of emerald stone. A Zambian origin emerald stone is regarded as the best emerald stone. While determining the pricing of ruby, the very famous four ubiquitous principals to determine the price of a stone is exercised. While determining the price of ruby the color of a ruby stone has given the utmost importance. 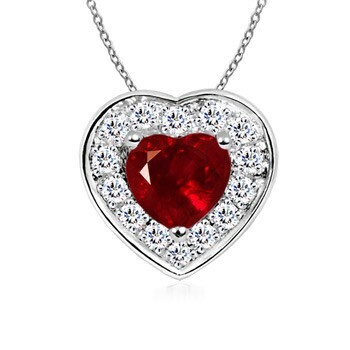 A dark red color ruby stone or pigeon red color ruby’s price is set high. Subsequently, to decide its price other parameters are being evaluated like cut, inclusions, carat. A stone with fewer inclusions or slight inclusions is sold at a high price. Whereas, while evaluating an emerald stone its green color and inclusions are given slightly more importance. A high-quality emerald stone is considered as that stone which pertains almost negligible inclusions and green color. Ruby gemstone with its impelling color appeal to both men and women. 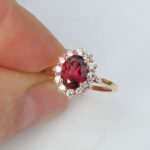 The women happily adopt a ruby stone in their wedding and engagement jewelry items. Besides this, they also tend to wear this stone while going to date and casual parties. The appealing color of this stone, even appeals to men of all ages, hence, men also wear ruby stone in rings, lockets, and bracelet. On the contrary, emerald with its elegant green color looks great and admirable, especially for women when they adopt it in the form of necklace, pendants or earrings. However, men can also wear emerald stone as a ring, bracelet because the use of this stone is not bound to females only. 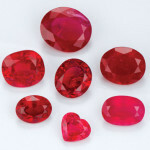 Ruby gemstone is costly due to its excellent qualities and uprising demand in the gem and jewelry market. The mesmerizing stone is being compared with diamond due to its brilliant qualities and ever-rising demand. On the price front, ruby has a slight edge over the emerald stone. Nevertheless, it does not mean that this stone is less in demand. The emerald stone is also in high demand and sold at a high price.